When willingness to take responsibility embraces a broad sphere and is free and fearless, even one individual can spread a mantle of influence far beyond his immediate perimeter. It is, as L. Ron Hubbard states, a phenomenon that defies reasonable explanation. In a message of compelling urgency, here is technology not only to magically transform a life, a marriage or an organization, but to revive purposes and functions across whole nations. Just as automaticities exist in the mind, so they do in nations. Just as they lead to disabilities in a person, so they cause a decay of national pride, freedom and ability. For their common denominator is an unwillingness to take responsibility. And the consequences, on both an individual and a national scale, are evident in the societal ruin strewn across the path of every Scientologist. In contrast, when willingness to take responsibility for others embraces a broad sphere and is free and fearless, even one individual can spread a mantle of influence far beyond his immediate perimeter. It is, as L. Ron Hubbard states, a phenomenon that defies reasonable explanation. 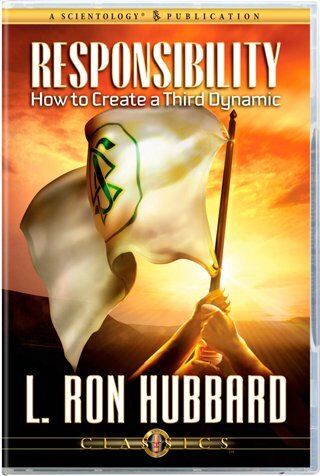 Thus he provides the means for Scientologists to create a true Third Dynamic. For on that central pivot hinges the expansion of Scientology and, hence, the survival of civilization itself. In a message of compelling urgency, here is technology not only to magically transform a life, a marriage or an organization, but to revive purposes and functions across whole nations.